Beetles belong to the order of Coleoptera, the most diverse group of organisms there is. The occur on all continents and in all countries except on Antarctica. From the egg of a beetle a larva emerges. This larva looks nothing like the adult stage of its life, but generally looks more like a fat caterpillar. This larva is also called a grub. Grubs will generally eat continuously and will shed their skin around four times. After the final larval stage, it will develop into a pupa. This is a life stage that cannot move and cannot eat. In this stage the body plan is altered to change the larval stage into the adult stage. From the pupa the adult beetle will emerge. This life stage is called the imago. This life stage can usually fly and is responsible for reproduction and dispersion. Beetles are distinguished from other insect orders by their wings; the front wings are rigid and though and cover the hind wings. The hind wings are membranous and used for flying. Like all insects, beetles have six legs, two antennae, four wings and 3 body segments. The larvae have six legs that are located in the front of their body. Some species have additional prolegs at the end of their abdomen. 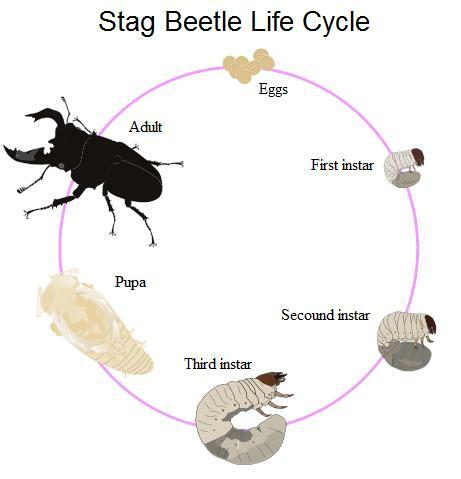 Some species of beetle have larvae that remain in the ground or inside wood and do not move a lot, while other species have larvae that walk around or even hunt for other insects (e.g. ladybug larvae). Beetles and grubs have all the senses we have, taste, smell, hearing, touch and sight, but most of these senses are not well developed. Larvae probably have good smell, taste and touch senses but not more than that. 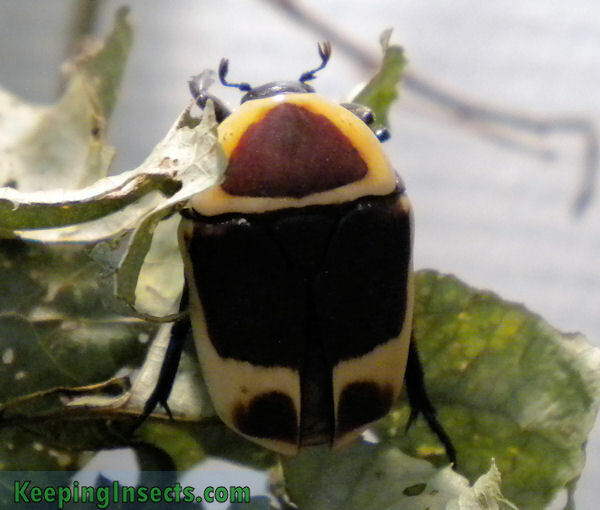 Adult beetles rely mostly on their sense of smell and sometimes sight and touch. Beetles can see ultraviolet light, making their sense of sight completely different from our own. Their sense of smell is used for finding food but also for finding mates; female beetles excrete pheromones that can attract adult males from miles away. Because the order of Coleoptera is so diverse, their habitat and behavior is also very diverse. Beetles can be found in any type of habitat; dry, moist, hot, cold but also deep in the ground, in trees, inside fruit, inside seeds, inside leaves, inside dead wood, inside live plants and in carcasses. Generally the larvae live their live inside of their food source, while the adults disperse. The food source for adults and for larvae is generally completely different. Larvae eat a lot, especially plant material but also meat or dung, while the adults eat some fruit, nectar, other insects or plant material.